Last Thursday, a court hearing in Jersey City setting a trial date became the venue for filing additional criminal complaints by Hoboken Councilwoman Beth Mason against MSV. The complaints were filed after the hearing by Beth Mason for the alleged snapping of a photo on a smartphone while seated 75 feet away in the lobby Thursday morning as she along with her attorney Steve Kleinman walked on the opposite side of the large open area. During the hearing the prosecutor for Jersey City stated Beth Mason "recognized she was a public figure" but that didn't prevent her from filing her latest criminal complaints directly after the hearing. Mason had cancelled three consecutive hearing dates earlier in 2015 after filing a September criminal complaint alleging harassment for being handed a subpoena in the Bajardi v Pincus civil trial. Beth Mason did not attend the Hoboken City Council meeting the previous night. Steve Kleinman is the former Hoboken Corporation Counsel when the disastrous early retirement plan unapproved under NJ law would later cost the City of Hoboken $5,000,000. In recent years he's worked for Beth Mason. As part of his work on behalf of Beth Mason, emails appear with James Barracato, Richard Mason of law firm Wachtell, Lipton, Rosen & Katz and Lane Bajardi as part of Mason's continuous political operations in Hoboken. A trial on Beth Mason's complaints is scheduled for May 28. 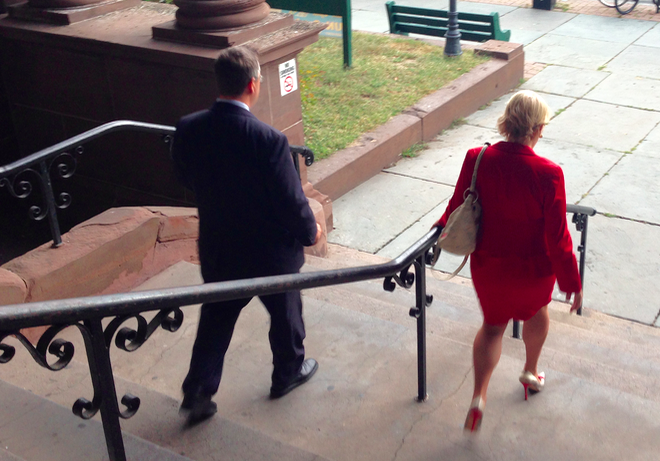 Attorney Steve Kleinman departs Hoboken Municipal Court last September with Beth Mason after her criminal complaint was moved on a change of venue due to her being a public figure and City Council member. She added another criminal complaint saying an alleged photo taken from about 75 feet away on a smartphone is also criminal harassment. At last month's Hoboken City Council meeting, Beth Mason declared the emails found in Lane Bajardi's email account from Mayor Dawn Zimmer's office were obtained legally via a public records request. MSV investigated all OPRA requests last year and determined no such request was ever made and approved. A true and complete email from James Barracato to Richard Mason of Wachtell, Lipton, Rosen & Katz, Steve Kleinman, Beth Mason, Adam Alonso and Lane Bajardi dated November 12, 2011 follows. Lane Bajardi claimed in multiple sworn declaration to Hudson Superior Court he ceased all "civic" involvement in Hoboken in July 2011. Related: Earlier story detailing Councilwoman Beth Mason's criminal complaint when handed a subpoena in a white no. 10 envelope at the front of the City Council dais just before the start of the September 21st meeting.